Here you find the dance and fitness professionals who took the certification course with Kim Jordan Creations, were assessed, received a positive evaluation and hold a license to perform under KJC method and philosophy. Clases para adolescentes, pedagogía con enfoque feminista. Teaching Languages: Mostly German and English every now and then. "The great thing about teaching booty dance classes are the reactions of the students like happiness, power, self esteem. Also, it's a pleasure to create classes and choreographies based on all the great information. It's a pleasure to work with it as it is the full package of all you need to know." For information about classes with Becky, visit Schönheitstanz Studio Berlin or Schönheitstanz Studio Berlin On Facebook. Becky took several classes in salsa, ballet, belly dance and hip hop/ street dance in the past. In 2009 she started pole dancing at Schönheitstanz-Studio Berlin and took some burlesque classes when there was time. In 2014 she started teaching pole dance, as well as lap dance and striptease. In September 2015 Becky became a Kim Jordan Creations certified instructor. "I fell in love with Kim when she visited our studio for the very first time. She is a great instructor and is inspiring me a lot. Booty dance is so much fun, gives you self confidence and is about celebrating your body and your femininity. On top of that it is a great workout. Kim's class structures fits everybody from male to female, from beginner to advanced. 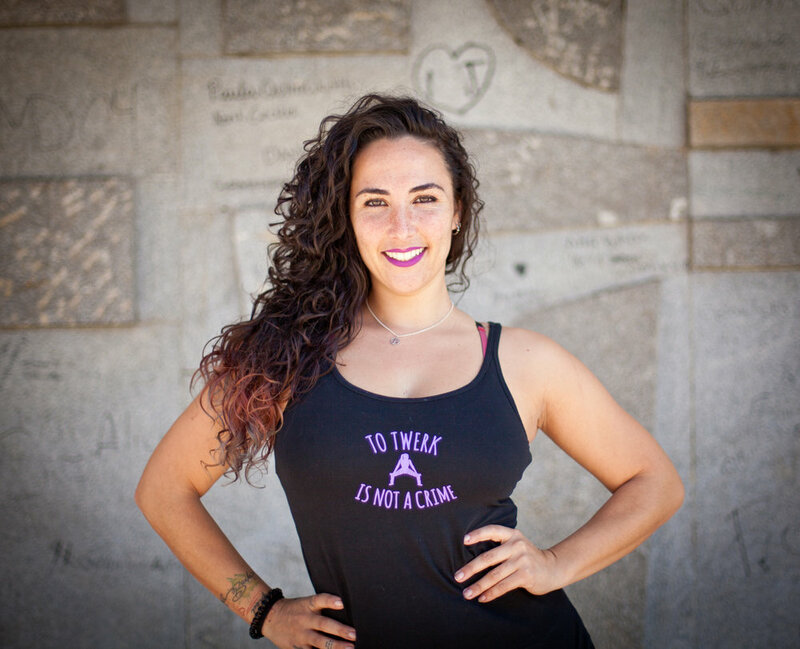 She always takes care that nobody get's any physical health problems and makes sure that we know the roots of the dance styles we are dancing.. All that is what I want to give to my students as well." A.E.M.A.- Barcelona. Certificado de Instructora de Funk y Hip-Hop. Celebrado en el gimnasio S-TUIDO. Expedido el 21 de febrero de 2004. ORTHOS certificado: Escuela de danza. Monitora de Funk y Hip-Hop. Expedido en Barcelona el día 3 de noviembre de 2005. Acreditada por haber superado las pruebas del curso habiendo obtenido la calificación final de sobresaliente. Esport 3. Certificado de asistencia al curso de formación Pilates Básico y Batuka, el día 25 de marzo de 2006. ZUMBA Fitness. Instructora oficial de Zumba Fitness, 24 mayo 2014. Asistiendo actualmente a clases de clásico, moderno, salsa cubana, Hip-hop y New style..
Bachillerato científico. Selectividad aprobada en 2004. Estudios universitarios: magisterio con especialidad en educación física. ESTILOS: Hip hop, Zumba, Aero-Latino & Booty Dance.